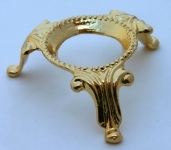 Kaleidoscope egg stand 25mm high, three leg, metal, gold colour plated. Suitable for Mini Kaleidoscope Egg kits. Display your woodturning to it's best advantage with this great looking display stand.